Tag Archives for " Fascination Advantage Test "
Value propositions are a sales and marketing staple. It’s very difficult to get a purchasing conversation started unless the potential buyer understands some way in which a product or service they are considering adds value in a way that is somewhat unique from other offering. Lacking a strong value proposition lands one in the commodity pile. What about people though? Can a salesperson have a value proposition or unique ability to add value? I think they most certainly can and one of the keys to standing out in a competitive sales landscape is to discover, communicate and amplify your greatest strength as your individual value proposition. Every organization must provide value through its offerings first and foremost but as a buyer considers options the value proposition, reputation, process and brand of the individual sales guide can play a role in the final buying decision and certainly plays a huge role in customer loyalty in the long run. How you sell is just as important as what you sell and who you are dictates your best way to teach, advise and sell. The fist step to using this notion is to gain a better understanding of your personality strengths and how you impact those with which you interact – your value proposition. Simply considering this notion will make you a better salesperson no matter the circumstance. To take this step I suggest a couple of bodies of research. The first is the work of my friend Sally Hogshead who’s best selling book Fascinate must be on your reading list. Sally is this week’s guest on the Duct Tape Marketing Podcast and famously shows people how to fascinate using their own unique “archetype” in eight seconds or less! The second is the work and insight of something called the Kolbe Index. Both Kolbe and Hogshead focus on helping people discover their unique ability with an eye on using that in a way that benefits all around you rather than trying to shore up weaknesses or be more of something you’re not. Perhaps you’ve taken personality tests in the past or been told you have a certain makeup that’s perfect for sales, but I contend, and both of the above resources support this, that there is no right or wrong personality for sales. Sure, if you’re job calls for you go out and cold call all day, you might want to have a certain Teflonlike makeup, but if you understand that your job is to educate and bring insight in order to create a better sales process than your competitors, than understanding your core strength and figuring how to use that to add value is the most important way to differentiate in a meaningful manner. I suggest every business owner, entrepreneur and salesperson take both the Kolbe Index and the Fascination Advantage Test or better yet take this idea to your sales and marketing departments and have the entire team assess their personal brand strengths. One of the first things that many people who take this step commonly experience is that it’s very empowering. In some cases simply knowing what to lead with clears up a great deal of confusion about the way you should work to be most effective. Many personality tests measure how you see the world, but these two also work on helping you understand how the world sees you. The Fascination Advantage is a science-based personal brand assessment, incorporating results of 125,000 participants. 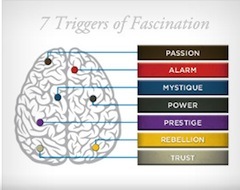 The test was created by Sally Hogshead, and developed by the team at Fascinate, Inc., this test will reveal how your personality adds distinct value.